Thirteen years ago, an unlikely hero—one comprised of stitched burlap, pins and a healthy appreciation for second line jazz—emerged from the New Orleans bayou to star in his very own darkly humorous 3D platformer. Voodoo Vince, as he was appropriately christened, has managed to accrue quite the cult following since his exclusive original Xbox outing, though surprisingly the game never acquired backwards compatibility for any of the successive Xboxes. But it may be for the best, seeing that in early 2017, the retro classic will be receiving a current generation makeover for Steam, Xbox One and Windows 10. So as Vince readies himself for a triumphant (and high definition) reincarnation, it seems appropriate to return to his humble French Quarter roots. In an old city and in an old neighborhood, resting atop a shelf inside a dimly lit voodoo shop, we find Madame Charmain’s third best voodoo doll. And it’s here where Vince’s black magic story begins. 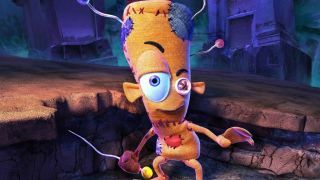 Development on Voodoo Vince commenced in the summer of 2001, just months before Microsoft’s 8.5-pound DirectX behemoth was set to hit store shelves. And though Vince didn’t have the same squeaky clean proclivities as Mario or Sonic, it does seem he could have easily represented Microsoft’s first home gaming console. As it turns out, the potential was there, albeit as a pipedream of sorts. For both audio and soundtrack duties, Clayton enlisted the talents of Steve Kirk, a composer who was more than up for the challenge of scoring Vince’s unsettling Louisiana escapade. From the outset, it was an ideal partnership.